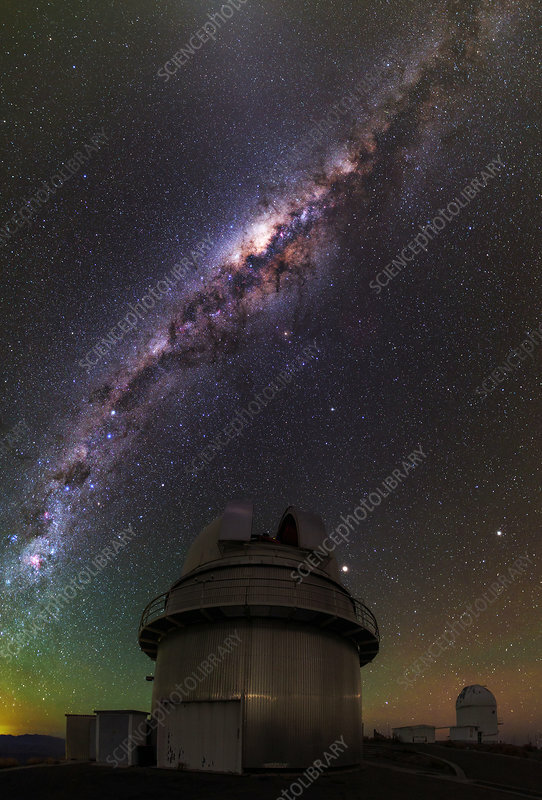 Milky Way over La Silla observatory. View of the Milky Way over telescopes at the La Silla observatory in the southern Atacama Desert, Chile. This site is operated by the European Southern Observatory (ESO). La Silla was ESO's first observing site and is still one of the leading observatories in the southern hemisphere. In the foreground is the Danish National Telescope. In the sky the Southern Cross and bright stars Alpha and Beta Centauri (left) can be seen in constellations Sagittarius and Scorpio. Mars (bright) can be seem next to the Danish telescope. The green and red light near the horizon is airglow - a natural emission of the Earth's upper atmosphere.